Say Hello To The 500 Block of Fayetteville St. This past weekend, there was a small section of sidewalk that was not blocked by the white and orange barriers on Fayetteville St. I’m not sure if that means that the sidewalk is officially open but no one stopped me from walking over and roaming around the 500 block of the street. We all know that this block is only half done as the parking deck across from the Marriott Hotel is under construction, which will then be followed by Charter Square but that is still at least a year away. Here is what to expect in the near future. Obviously with the parking deck construction, this block is pretty one sided and is dominated by the new Marriot Hotel. 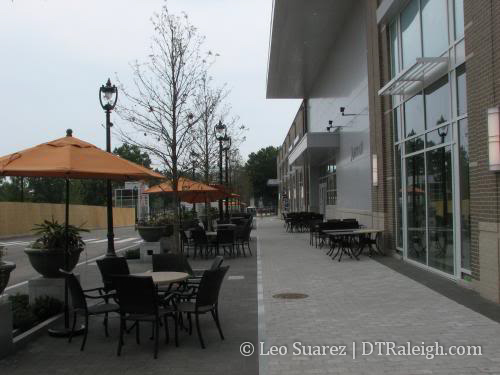 There are three elements to the sidewalk; two food shops and the hotel lobby roundabout. 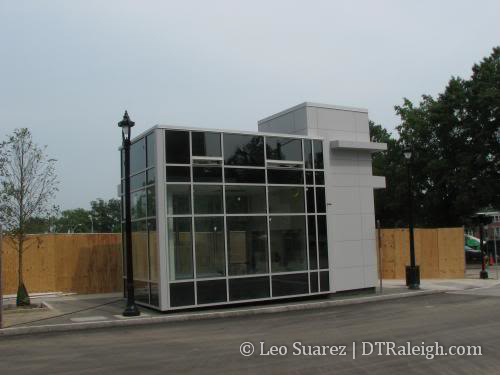 The smaller space is occupied by a Starbucks and by the looks of it, it is pretty much ready to go. The much larger space is going to be a restaurant, named Posta, which runs almost the complete length of the hotel. Pedestrians have one access directly into Starbucks or another to the lobby and into Posta. Car access to the roundabout is by Fayetteville St. only. It appears that there is a very wide pedestrian access to Salisbury, and the convention center, between the hotel and BB&T. Wide pedestrian walkway to the convention center. It also looks like it will be very well lit. 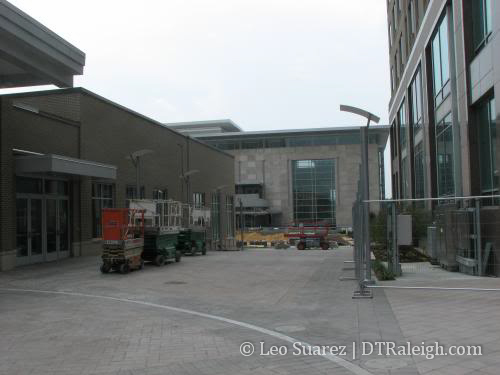 Below is the much talked about sidewalk parking deck entrance. This sits across the street from the hotel, on the corner of Lenoir and Fayetteville St. The entrance is covered and provides one elevator and one staircase to the parking below ground. For added convenience, there is also a parking pay station inside. The streetlights are ready so as soon as Lenoir St. is converted to two-way mode, the hotel will be fully up and running. 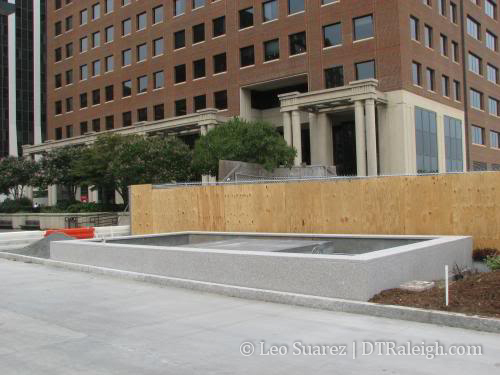 I’m still curious to know if traffic will flow through the future City Plaza while it is under construction. My instinct says ‘no’ and we will have to wait until Sept. 2009 until Fayetteville St. is drivable from one end to the other. 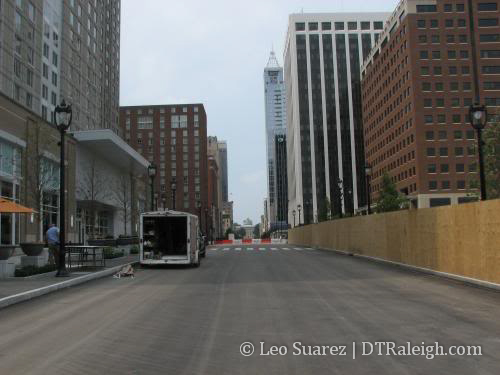 Excellent presentation of the 500 block of Fayetteville Street!!! Naturally, we’ll get the full effect when Charter Square is finished, but even the current conditions show promise. Love the outdoor seating, as shown in one of your photos. Great Update: Not too fond of the alley way near Marriott entrance (hope they are going to dress that alley way up a bit). Also, that elevator is an eyesore (city council, who approved this white elephant?). It restricts your view down F Street from the Progress Center. Let’s bring Plensa back if your going to add this type of crap to F Street! Leo, your instincts are correct on the plaza. It will be closed to vehicles until the new city plaza is built, so Fayetteville St will dead end on two sides… although pedestrians will be able to make the move. I agree the elevator looks out of place. I wish there was an out-of-the-way place for it. Thanks for that info, Chief. It all can’t be perfect I guess but in the near future when the construction is done, we won’t even think twice about it. I’m quite surprised to see not too much chitter-chatter about the Starbucks they put in there. For any avid Starbucks drinker, having a location in the true heart of downtown is absolutely amazing! Of course, I know many people hate Starbucks aswell, which would explain the lack of buzz for the new facility. I think most of the people on here frequent more kinds of independent coffee shops. I myself usually end up at Global Village because I love the atmosphere and people there. They usually start making my order when I walk in the door because I’ve been going there for about 4 years now. Starbucks I feel like that “community” feel just isn’t there. If Global is closed I’ll usually head to either 3rd Place at Five Points or Crema on Fayetteville Street.